Use System Setup > Roles & Role Membership to control which users can see, edit, create, and delete. Roles are assigned to users. They let you specify which areas of Current RMS your users can see, and whether or not they can create, edit, and delete records in those areas. All users must have at least one role. You can also restrict access to order values throughout your system. To add a role, go to System Setup > Roles & Role Membership, then click the green add role button. Use the matrix of tick boxes to control what a user with this role assigned to them can see (show), create, edit, or delete. Remember that some permissions here might conflict with others. For example, if a user may edit opportunities, they’ll also have access to products because products are added to opportunities. 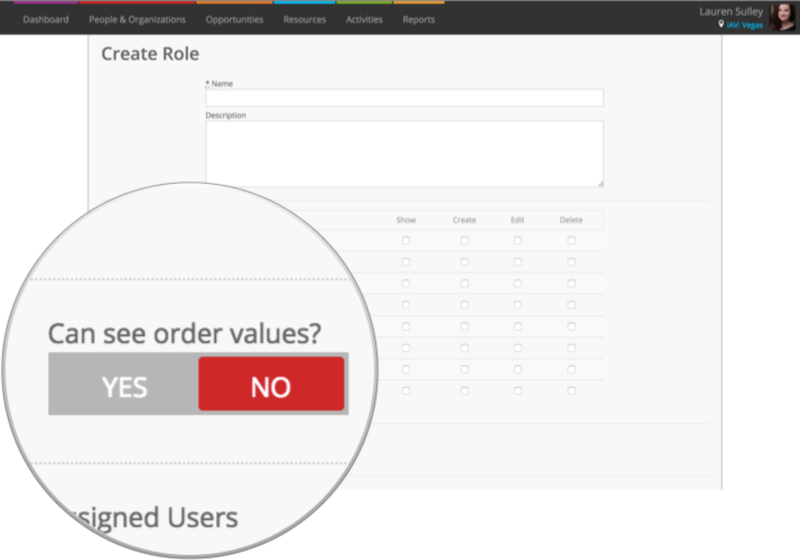 If you don’t want users with this role to see order values, toggle this to NO. This hides financial figures throughout Current RMS, including the sales pipeline on the Dashboard and charge totals on opportunities & invoices. Keep in mind that prices of products in Resources > Products and opportunity documents might still be visible, depending on how you have set up your roles. Toggle to NO to prevent users with this role from accessing opportunities where they’re not the owner or a participant. Choose which functions on the opportunity detail view that users with this role my access. This is handy if you’d like to prevent your warehouse team from editing opportunities. Tick boxes here to apply this role to your users. You don’t have to do this just yet, you can always edit a user account to apply a role to it. Why might you create roles? Don’t want any staff to be able to delete records? Make sure all of the delete boxes are unticked. For a simple warehouse account, you could select only that a role can show and edit opportunities, products, and quarantines. Create an account for an accountant or bookkeeper by allowing access only to Invoices & Credits. Roles can be combined, useful for letting you create roles around duties. For example, you might have a role called “Invoicing” and a role called “Sales”. Your sales role might include permission to show, create, edit, and delete opportunities, projects, and records in People & Organizations. Your invoicing role might grant permission to show, create, edit, and delete invoices and credits. Users that are marked as administrators have full access, regardless of the roles that you’ve applied to their account. System Setup allows you to make wide ranging changes to your system and billing, so it’s restricted to administrator users only. Reports contain real insight into your business that you might wish to keep confidential. Once an opportunity has been converted to an order, the opportunity is confirmed. At this point, paperwork such as the Rental Agreement might have been generated and printed, so changing the customer is something that's controlled and limited. Furthermore, changing the customer can impact your taxation settings. Changing the opening balance on a stock level is restricted to administrators to prevent stock levels being adjusted without a transaction. You can apply roles to documents to control who can access them. Do this by editing the document layout in System Setup > Document Layouts. This is important in cases where you’ve toggled the “Can see order values” slider to NO – even if your users can’t see order values, they might still be able to generate document that have order values on them. Set up roles against custom views to determine which users can see custom views that you create. This is especially handy for creating views for particular departments, e.g. views that show your warehouse staff what’s to prep, or views of uninvoiced opportunities for your accounts team.